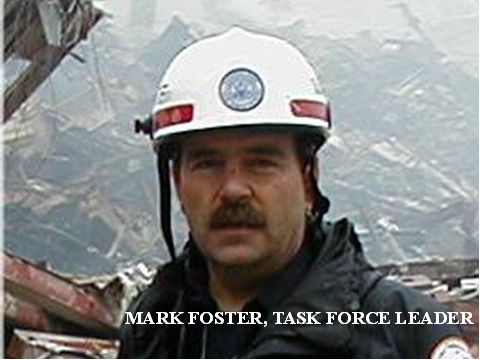 The Deployment to the WTC was MATF’s first emergency response deployment as a Type 1 Task Force (we had deployed to the Atlanta Olympics in 1996 and had a modular deployment to the Worcester Fire in 1999). In reviewing the AAR it is important to notice the 40 of the 62 WTC responders are still on the Task Force. Many of the lessons learned at the WTC still are valid today. I tell people when they come see our team, extensive cache and fleet of trucks: “We responded to the WTC with practically nothing compared to today, and we performed flawlessly, it’s never about the equipment, it’s about the people”. 9/11 was a turning point for the Task Force, FEMA and the Country. This year I’d like to try something. If you were with the team on 9/11 write a paragraph or so about an experience of yours on 9/11 and I will share it with the team. If you were not on the team on 9/11 please write about something that you remembered from that period and I will share it also. If you are one of the new MATF Recruits, I would highly suggest you read these.